The team from Linley & Simpson are aiming to deliver a sackful of Christmas cheer to a raft of charities and good causes – including help for homeless people. Three charities that aim to improve the lives of rough sleepers will benefit – from Leeds-based St George’s Crypt, Harrogate Homeless Project, to SASH (Safe and Sound Homes) in York. It has helped volunteers at St George’s Crypt to fill the Christmas stockings of over 50 homeless people this Christmas – the charity strives to make Christmas as fun as possible so its people get a break from all the troubles in their lives. The agency is also raising awareness of the needs of Yorkshire’s homeless community, especially at Christmas, by promoting these link-ups through door drops, social media and email. 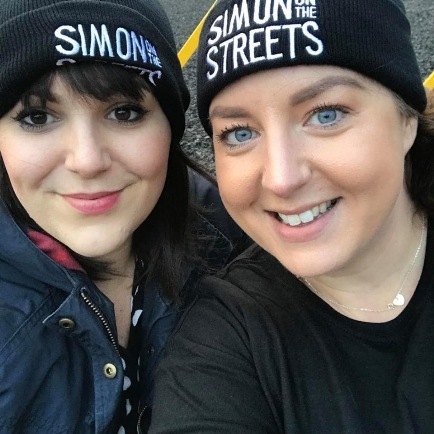 The support will build on the money raised by two Linley & Simpson colleagues, Leeds city centre branch manager Lauren Sayles and colleague, Amy Norman (senior sales negotiator) who took part in this year’s Sleep With Simon event in the city. Martin House Children’s Hospice at Boston Spa – the agency’s chosen charity partner – is also a key benefactor of the Christmas fund-raising campaign. Teams from its Harrogate, Wetherby, Ripon, Horsforth and Saltaire branches are once again selling Martin House Christmas cards at various markets and Morrisons stores across Yorkshire and are hoping their efforts top last year’s, when over £2,000 was collected. Meanwhile Lynne Taylor, the agency’s Accounts Manager and Associate Director, will be donning a red suit and white beard by taking part in the Santa on the Run event staged in Wetherby by Martin House on Sunday December 2. The Martin House fund-raising events will culminate with the company’s annual Christmas jumper day and photo competition which takes place on Friday December 14. Mission Christmas – the agency is supporting the Radio Aire Cash for Kids Mission Christmas appeal, with nine of its branches acting as a drop-off location for presents and a gifts for disadvantaged and ill children across the region. Saltaire Inspired – Linley & Simpson is sponsoring the Living Advent Calendar, which has been a feature of the village since 2006, for the first time this year. It will also have a window in the display, which sees houses and buildings across the community lit up. Emily Wilkinson, Linley & Simpson’s Customer Services Manager, said: “Thanks to the enthusiasm of colleagues, this year marks our biggest – and most ambitious – festive fund-raising campaign. “While it is a joyous time for many, it is also very difficult and stressful time for disadvantaged and less fortunate people in our community and those with serious illness, particularly children and young people. Linley & Simpson’s branches can be found at Leeds city centre, Roundhay, Horsforth, Chapel Allerton; Harrogate, Ripon, Wetherby, York, Ilkley, Saltaire and Wakefield.